Sometimes, when you paint your nails, you can dirt the area where you are making you manicure. And that area can be the carpet, clothes or other upholstery. The good news is that this problem can be easily fixed if you act immediately in removing the stain. Before beginning the procedure, check the tag to see if the clothing item contains acetate or triacetate. In this case, it’s not recommended to follow this procedure because acetone can burn the fabric. Even for those clothing items that require dry cleaning isn’t recommended this procedure, because there is a change to make it look even worse. 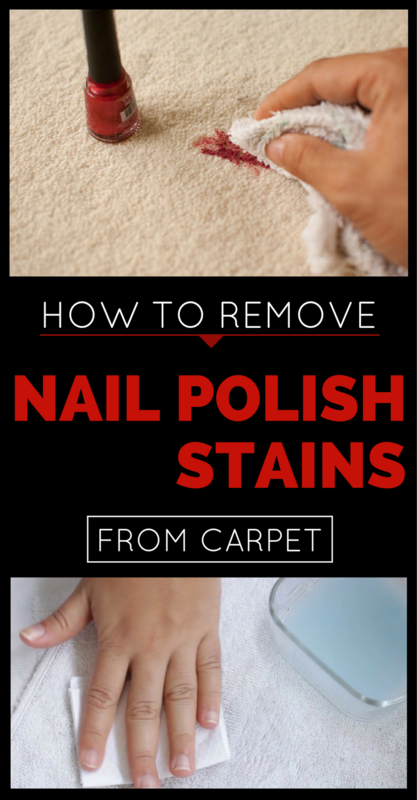 Try to remove the nails polish excess from clothes as soon as it stains. Then dip a paper towel in nail polish remover. Place the clothing item on a flat surface and put the paper towel over the stained area. The nail polish in the fabric will begin transferring to the paper towel. Remove the towel and replace it with another one until the stain is completely removed. completely removed. Repeat the procedure until the stain is completely removed. You can use hydrogen peroxide is the nail polish stain isn’t completely removed. If the nail polish is fresh, remove the excess from the upholstery using a paper towel or a soft cotton cloth. Don’t rub, as the color will penetrate into the depth of the fabric. Test it on a small side to see how acetone will react. Soften a paper towel in acetone and leave it over the stain. Don’t pour acetone directly onto the upholstery, because nail polish can impregnate too much in the material. Then, with a cotton cloth moisten in liquid soap try to remove the rest of the nail polish.